Wash and clean the chicken. Cut into desired size pieces. Mix the ginger garlic paste, lemon juice, turmeric and garam masala powder into the chicken. Let the chicken marinate for 30 mins – 1 hr. Soak the poppy seeds in half a cup of hot water for 10-15 mins. In a grinder, add the poppy seeds and green chillies and make into a fine paste. Keep it aside. Heat oil in a pan. Add the cinnamon stick, green cardamoms and the cloves and stir fry for 10-15 secs. Add the chopped onions and fry till the onions become soft and light pink. Then add the chopped tomatoes and fry till the tomatoes are mushy. Add the turmeric powder, chilli powder and salt and cook till the oil starts separating from the gravy. Add the marinated chicken pieces and mix it well so that the chicken pieces are nicely coated. Fry for another 5-6 mins. Then add the poppy seeds paste and cook for 5-10 mins on low flame. Add a cup of water, cover the pan and cook for another 10 mins till the chicken becomes tender. Sprinkle garam masala over the curry, mix well and garnish with chopped coriander/cilantro. Serve with rice or chappatis. 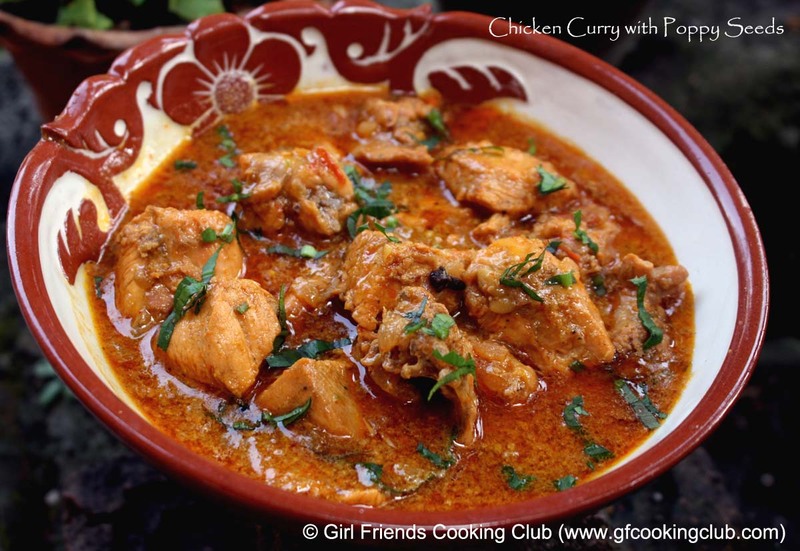 This entry was posted in Chicken and tagged Chicken Curry with Poppy Seeds, Posto Murghi by Kamakshi. Bookmark the permalink.